Scientific knowledge is always in a state of flux. New scientific discoveries come along and overthrow long-held hypotheses. A good example of this is the attempt by humanity to explain the phenomenon of light. Before the dawn of science, humanity relied on religious experience and philosophy to understand light and the cosmos. The Bible declares the universe began when God said, "Let there be light." Ancient religious texts throughout history have associated light with divine consciousness - a consciousness from which everything, including all other consciousness, originated. The Bible declares, "God is light." Eminent physicist, David Bohm, viewed all matter as "condensed" or "frozen light." Physicist Stephen Hawking once stated ,"When you break subatomic particles down to their most elemental level, you are left with nothing but pure light." Science discovered light was pervasive at the beginning of the universe. Scientists recently discovered the so-called "God Particle" - the particle which bestows mass upon all other particles. This particle is very crucial to physics because it is our final understanding of the structure of all matter. Albert Einstein's great equation E=mc2 (where E is for energy, m for mass and c is the speed of light) describes the awesome power and energy holding all atoms together. Surprisingly, the Bible supports Einstein's equation when it declares: "God is the invisible power holding all things together." This transcendent view of consciousness is the basis for major world religions. So it shouldn't be surprising why top quantum physicists were influenced by religion. Erwin Schrodinger, for example, studied Hinduism; Werner Heisenberg looked into Plato's theory of the ancient Greeks; Niels Bohr was drawn to the Tao; Wolfgang Pauli to the Kabbalah; and Max Plank to Christianity. The scientific discovery of the nature of light is the cornerstone of modern physics and natural law. It is also the cornerstone of near-death studies and modern consciousness research. Over the centuries, science has yielded some very unusual, almost "god-like," properties of light. The recently discovered "God particle" - the elusive particle which gives mass to every other particle - is one of the greatest discoveries in science. Light was pervasive at the time of the Big Bang. Light is the fastest thing in the universe and travels at 671 million miles per hour. It takes an infinite amount of energy to move an object to the speed of light. At the speed of light, the past, present, and future all exist simultaneously. If a person could travel at the speed of light, they would become immortal. There is also the quantum theory of superposition where matter can exist in more than one dimension at the same time - making anomalous phenomena such as NDEs and OBEs possible. Physicists have experimentally demonstrated how two particles can be separated, and no matter by how far apart they are (even a billion miles apart), a change in one particle instantly creates a simultaneous change in the other as if they were connected. This phenomenon called "quantum entanglement" which Einstein called "spooky actions from a distance" and is suggestive of an underlying reality which physicists have not yet been able to explain although there are many theories. Light also has a "dual personality" existing as both a particle and a wave. The reason we can see anything at all is because our mere observation of things converts light waves into light particles thereby making human consciousness the main factor when it comes to reality. Carl Jung (1875-1961) the Swiss psychologist and near-death experiencer who founded analytical psychology, is best known for his psychological concepts including archetypes, the collective unconscious, dream analysis, and synchronicity. His interest in philosophy and metaphysics led many to view him as a mystic. Following discussions with both Albert Einstein and Wolfgang Pauli (two founding fathers of quantum physics) Jung believed there were parallels between synchronicity and the relativity of time and its connection to consciousness. Scientists are discovering how objective reality is more of an illusion than a reality. At deeper levels, everything - atoms, cells, molecules, plants, animals, and people participate in a connected flowing web of information. At the quantum level, the observer becomes a part of the observed and the distinction between observer and object disappears. Space and time are concepts we bring with us to the quantum level but they do not seem to exist there. Time flows both forward and backward symmetrically according to relativity - a concept making time travel a possibility. And because all matter, including our brains and bodies, are mostly composed of empty space because of the structure of atoms held together by atomic energy, a metaphysical case can be made that we are mostly composed of non-physical "spirit." At the quantum level, location becomes nonlocal and everything can be thought of as being in no particular place at no particular time. What we "see" out there has more to do with our own consciousness and subjective experience than anything "out there". In light of these findings, we must conclude the notion of objective reality is in error. Physicists are discovering laws of physics are the laws of our own minds. One of the most compelling theories is called the holographic principle which defines the universe as a single, gigantic hologram where everything is connected to everything else including our minds. Metaphysically speaking, the brain processes cosmic information in the form of holograms - the "mind's eye." The holographic principle originated from one of the most significant theoretical physicists of the 20th century, David Bohm. Neurophysiologist Karl Pribram synchronistically arrived at a holographic model of the mind and brain at the same time as David Bohm developed his holographic model of the universe. Surprisingly, these holographic models may be the basis for all mystical experiences including the NDE. These holographic models are part of a new emerging paradigm called "holism" which is the opposite of reductionism. It is the paradigm where all natural systems - physical, biological, chemical, social, economic, etc. - and their properties, should be viewed as a whole and not the sum of its parts. A corresponding theory of quantum consciousness was developed by the joint work of theoretical physicist, Sir Roger Penrose, and anesthesiologist Stuart Hameroff. Like David Bohm and Karl Pribram before them, Penrose and Hameroff developed their theories synchronistically. Penrose approached the problem of consciousness from the view point of mathematics, while Hameroff approached it from his career in anesthesia which gave him an interest in brain structures. Quantum consciousness is the theory of an underlying consciousness connecting everyone and everything and is based upon quantum fields being interpreted as extending infinitely in space. Carl Jung referred to this connection between all life as the "collective unconscious" also known as the "collective subconscious." Jung theorized how synchronicity serves a role similar to dreams, with the purpose of shifting a person's egocentric conscious thinking to greater wholeness. Jung was transfixed by the idea of life not being a series of random events but rather an expression of a deeper order, which he and Wolfgang Pauli referred to as "one world" - a term referring to the concept of an underlying unified reality of the universe from which everything emerges and returns to. Jung believed this principle of an underlying "world" can express itself through synchronicity and is the basis for quantum mysticism. Quantum theories such as the many-worlds interpretation of quantum mechanics and its corresponding many-minds theory supports this new paradigm. These quantum theories also supports the theory of quantum immortality which theoretically makes the immortality of a non-physical "soul" possible. If one views consciousness as a fundamental, non-physical, part of the universe, it becomes possible to conceive of consciousness continuing to exist after the death in a parallel universe. These quantum and holographic paradigms assume anomalous phenomena such as NDEs to certainly be within the realm of possibilities. Just as surprising is how NDE encounters with an otherworldly light correspond with the new paradigm found in the principles of quantum physics. Classical mechanics involving observing, theorizing, and predicting doesn't work very well when it comes to understanding light, consciousness, and subjective experiences - especially when it concerns the NDE. The old paradigm allowed materialists and skeptics to dismiss NDEs as being caused by brain anomalies - even though the cause of NDEs is not relevant to whether the experience is a real afterlife experience or not. Nevertheless, recent NDE studies have ruled out brain anomalies. Anyway, brain anomalies are side-effects of the near-death experience and not the cause of them. Skeptics must confront their unscientific logical fallacy of claiming NDEs are either hallucinations or are impossible since the brain is the origin of consciousness and a dead brain produces nothing. Even if one assumes NDEs to be merely a chemical reaction in the brain, there is no human experience of any description which cannot simply be reduced to a biological process, but this in no way offsets the meaning these experiences have for those who have them - whether it's falling in love, or grieving, or having a baby, or coming close to death and having a transcendental experience. Theoretical quantum physics supports the notion of our universe as being a conscious universe of which all other consciousness is a fractal. Many scientists no longer believe in a randomly generated universe from some sort of primal dust. Nobel prize winning molecular biologist Christian de Duve describes the universe as having a cosmic imperative to develop conscious life. The very structure of molecules composing living creatures dictates the evolution of conscious life. Astrophysicist Fred Hoyle agreed how the fundamental laws of the universe governing the creation of planets, suns and galaxies implies conscious life will be the end result of those universal laws. Evolutionary biologist Rupert Sheldrake goes even further, describing how "morphic forms" - patterns of energy which first exist in the universe - results in life. If these compelling theories are true, then it is possible to apply them to other dimensions of reality made up of other elementary subatomic particles. Anomalous phenomena such as NDEs then becomes less like "fantasy" and more like the perceptions of conscious beings in other realties which can be predicted by modern science. NDEs may simply be clinical applications of the experiments physicists have discovered in the lab. For example, a European astrophysicist by the name of Metod Saniga used NDE research to develop a mathematical model of time which seems to offer solutions to problems vexing scholars since Einstein. In brief, Dr. Saniga takes seriously the testimony of NDErs when they describe experiences in a realm where "time stops" and where some of them "see the past, present, and future all at once." Dr. Saniga describes this realm as "the Pure Present." Dr. Saniga used these anomalous experiences to describe a single mathematical model which can account for both the conventional and the extraordinary ways humans experience time. The father of the new paradigm, Albert Einstein, may have had the old paradigm in mind when he said, "All knowledge of reality starts from experience and ends in it." The old paradigm denies a whole range of valid subjective experiences such as NDEs, OBEs, and mystical experiences. Severe cracks in the old paradigm began to appear when, in 1982, a research team led by physicist Alain Aspect performed what may turn out to be one of the most important experiments of the 20th century. They discovered subatomic particles were able to remain in contact with one another regardless of the distance separating them - even if the distance is billions of miles. Aspect's findings seemed to violate the long-held theory of the impossibility of faster-than-light travel. These findings are suggestive of a deeper level of reality where all things in the universe are infinitely interconnected. Aspect's findings influenced one of the most significant theoretical physicists of the 20th century, David Bohm, to develop a profound mathematical theory where all the apparent separateness in the universe to be an illusion. Bohm's theory, known as the Holographic Principle, describes the universe to be a gigantic and splendidly detailed hologram. An example of a hologram appears in the movie "Star Wars" when an illusionary holographic image of Princess Lea was projected by the robot R2D2. The notion of reality as illusionary goes back to ancient indigenous people who believed existence to be a dream or an illusion. Modern developments in science have led theoretical physicists to view reality in a similar manner - a reality composed of a matrix, grids, virtual reality, simulation and holograms. A holographic universe explains the supersymmetry found in the universe and suggests how, at the quantum level, everything - atoms, cells, molecules, plants, animals, and people participate in a connected flowing web of information. For example, the electrons in a carbon atom in the human brain are connected to the subatomic particles comprising every other human brains - even with every star in the sky. All of nature can ultimately be viewed as one seamless web. In a holographic universe, time and space become an illusion. The past, present, and future all exist simultaneously suggesting the possibility of science to someday be able to reach into the holographic level of reality and extract scenes from the long-forgotten past - a phenomenon which has already been documented in NDE research from the life review. Another aspect of a holographic universe is the mathematical proof of every part of a hologram contains all the information possessed by the whole. If we try to take apart something constructed holographically, we will not get the pieces of which it is made, we will only get smaller wholes. This "whole in every part" nature of a holographic universe may be the basis for mystical experiences such as the NDE. It also agrees with the view of eastern mysticism: all consciousness exists as a part of a single Whole and a single Whole within all consciousness. This holographic paradigm supports mathematical principles found in fractal geometry and the metaphysical concept of non-physical fractal souls existing in a fractal universe. A holographic universe could theoretically be viewed as a Matrix bringing into existence everything else in our universe: all matter and energy - from atoms, to solar systems, to galaxies, etc. Such a Matrix could be viewed as a kind of cosmic storehouse of "All That Is" or the metaphysical concept of an "akashic field." Such a Matrix of "all information" could also be the basis for the NDE life review. David Bohm believed a holographic level of reality may be a "mere stage" beyond which lies "an infinity of further development." According to physicist Fred Alan Wolf, NDEs can be explained using a holographic model where death is merely a shifting of a person's consciousness from one dimension of the hologram to another. Craig Hogan, a physicist at Fermilab, generated even more interest in a holographic universe when he discovered proof of a holographic universe in the data of a gravitational wave detector. Profound evidence supporting the fractal nature of consciousness within a fractal universe can be seen the images on the right and left. On March 16, 2006, the journal Nature published a report of the discovery of an unprecedented elongated double helix nebula (see the image on the right) near the center of our Milky Way galaxy using observations from NASA's Spitzer Space Telescope. According to Mark Morris, a UCLA professor of physics and astronomy, said, "Nobody has ever seen anything like that before in the cosmic realm. Most nebulae are either spiral galaxies full of stars or formless amorphous conglomerations of dust and gas - space weather. What we see indicates a high degree of order." Notice how closely the DNA molecule looks like a fractal of this nebula. Other evidence supporting the fractal nature of consciousness can be seen in the images on the left. Mark Miller, a doctoral student at Brandeis University, researched how particular types of neurons in the brain are connected to one another. By staining thin slices of a mouse's brain, Miller could then identify the connections visually. The result can be seen in the image on the left labeled "The Brain Cell" (courtesy of Dr. Clifford Pickover) showing three neuron cells on the left (two red and one yellow) and their connections. 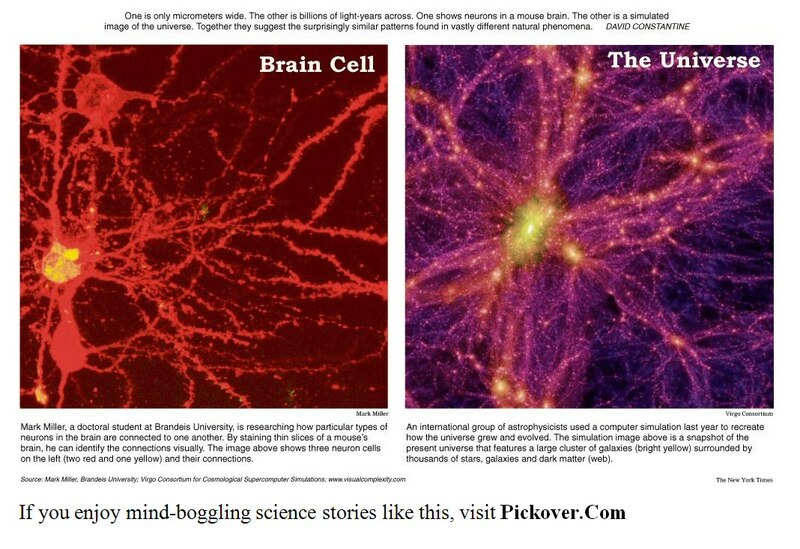 By comparing The Brain Cell image with The Universe image, we can easily see how these objects have the same structure. This begs the questions, "Do we exist within a gigantic brain?" and "Is the law of physics merely the laws of our own minds?" Learn more about the fractal nature of reality in Dr. Pickover's outstanding book The Physics Book: From the Big Bang to Quantum Resurrection. His other books, The Math Book and The Medical Book, are equally outstanding. Visit his main website and Twitter site. The Universe image on the left was created by an international group of astrophysicists called The Virgo Consortium using a computer simulation to recreate how the universe grew and evolved. The image is a snapshot of the present universe featuring a large cluster of galaxies (bright yellow) surrounded by thousands of stars, galaxies and dark matter. There are several theories of the universe within particle physics called "brane cosmology" where "brane" is a reference to "membrane" in M-Theory. In theoretical physics, a "brane" is a mathematical concept where our four-dimensional universe is restricted to a "brane" inside a higher-dimensional space composed of eleven theoretical dimensions - the three dimensions we can see, plus the dimension of time, plus the seven extra dimensions we can't see but M-theory theorizes are all around us. Surprisingly, the number of these dimensions agree with the number of "afterlife realms" described by NDEs and the major ancient religions of the world. The Internet image on the left is a visualization of the Internet showing the various routes through a portion of the Internet. Notice how the structure of a brain cell is the same as the structure of the Internet and the universe. Is this merely a coincidence? Or do these images graphically demonstrate the ancient principle of "as above, so below." The Internet image was generated by The Opte Project (pronounced op-tee which is Latin word for "optical") started by Barrett Lyon whose goal was to make an accurate representation of the extent of the Internet using visual graphics. The project was started in October 2003 in an effort to provide a useful network mapping of the Internet for the purposes of helping students learn more about the Internet. This map can also be used to visualize sites of disasters in the world by citing the significant destruction of Internet capabilities after a disaster. It can also be used as a gauge for the growth of the Internet and the areas of growth. But it also shows how the structure of the Internet is developing along the same lines as the structures of the human brain and the universe. The Universe image is featured at the Boston Museum of Science, the Museum of Modern Art and the Louvre. This "holistic" view of reality (as opposed to reductionist theories) can also be applied to the human brain. The holographic principle was a catalyst towards a theory of quantum consciousness called the "holonomic brain theory" which explains how the brain encodes memories in a holographic manner. This theory originated from neurophysiologist Karl Pribram who synchronistically arrived at a holographic model of the mind at the same time David Bohm was developing a holographic model of the universe. Taken all together, this holographic model is part of a new emerging paradigm called "holism." Holism is the principle of a whole system being more than just the sum of its parts. The best way to study the behavior of many complex systems is to treat it as a whole. One of the most amazing things about the human thinking process is how every piece of information seems instantly cross-correlated with every other piece of information within the brain - another feature intrinsic to the hologram. Because every portion of a hologram is infinitely interconnected with every other portion, the human brain is perhaps nature's supreme example of a cross-correlated, holistic system. A holistic storage of memory in the brain becomes more understandable in light of Pribram's holographic model of the brain. Another holistic property of the brain is how it is able to translate the avalanche of frequencies it receives via the senses (light frequencies, sound frequencies, etc.) into the concrete world of our perceptions. Consciousness and perception processes sources of light energy. Encoding and decoding light frequencies is precisely what a hologram does best. Just as a hologram functions as a lens which translates meaningless blurs of frequencies into a coherent image, Pribram theorizes the brain also comprises a lens (e.g., the eye) and uses holographic principles to mathematically convert frequencies received by the senses into the inner world of our perceptions. An impressive body of evidence suggests the brain uses holographic principles to perform its operations. Pribram's theory, in fact, has gained increasing support among neurophysiologists. A corresponding theory of quantum consciousness known as Orchestrated Objective Reduction (Orch-OR) was developed by the joint work of theoretical physicist, was developed by the joint work of theoretical physicist, Sir Roger Penrose, and anesthesiologist Stuart Hameroff. Like David Bohm and Karl Pribram before them, Penrose and Hameroff developed their theories synchronistically. Penrose approached the problem of consciousness from the view point of mathematics, while Hameroff approached it from his career in anesthesia which gave him an interest in brain structures. Mainstream theories assume consciousness emerged from the brain, so they focus particularly on complex computation at synapses allowing communication between neurons. Orch-OR assumes classical physics cannot fully explain consciousness. In the June 1994 issue of Discover Magazine, an article ran called "Quantum Consciousness" about how consciousness and quantum physics are intimately connected. This theory suggests consciousness can be found inside the microtubules of brain cells. At death, the information energy inside these microtubules - what some people refer to as the "soul" - doesn’t disappear; but instead, is retained in the universe. One of the fundamental laws in physics, the first law of thermodynamics, is energy cannot be created nor destroyed - it can only be converted. So if consciousness is indeed a form of energy, then according to the first law of thermodynamics, consciousness cannot be destroyed. Instead, it is converted into something else. On September 6, 2011, National Geographic published the article, "9/11 and Global Consciousness" about how random number generators at Princeton University's Global Consciousness Project detected a dramatic spike around the world before the time of the terrorist attack - an indication of global consciousness. The director of the project, Dr. Roger D. Nelson, describes in a YouTube video the details of this event. The media paid relatively little attention to this project until Nelson published his paper, "Coherent Consciousness and Reduced Randomness: Correlations on September 11, 2001." This prophecy given to Ned Dougherty is just one of the visions of the future he received during his NDE. Other near-death experiencers, such as Dannion Brinkley, were also visions of terrorist attack in New York and Washington. In fact, a great number of NDEs involve visions the future. The old materialistic paradigm, prevalent mostly in the West, disregards the possibility of out-of-body dimensions; whereas, the new paradigm supports them. For this reason, open-minded scientists have acknowledged the time is now to abandon the old paradigm and focus on the new one. Disregarding the old paradigm became even more reasonable when, in December of 2001, The Lancet (the United Kingdom's highly respected journal of medicine) published the results of a study by Dr. Pim van Lommel showing 18 percent of clinically dead patients having NDEs. Lommel's study documented verified events observed by such patients from a perspective removed from their bodies - called "veridical perception" - suggesting the existence of a transcendent consciousness. Such studies beg the question of why the scientific community at large remains mostly silent about these facts. Perhaps this is the reason why. Science may never be able to answer the question of whether or not consciousness survives bodily death; but current near-death studies, such as The AWARE Study (AWAreness during REsuscitation) is trying to find out. The director of this study, Dr. Sam Parnia M.D., is a critical care physician and director of resuscitation research at the Stony Brook University School of Medicine in New York. Dr. Parnia is recognized as an authority on the scientific study of death, the human mind–brain relationship, and near-death experience. Dr. Parnia is also the author of What Happens When We Die (2006) and Erasing Death: The Science That is Rewriting the Boundaries Between Life and Death (2013). In the late 90s, Dr. Parnia and Dr. Peter Fenwick he set up the first study of NDEs in the UK. Since then, they have published several articles in peer-reviewed scientific journals    in the field of near-death studies. Since Dr. Parnia has been part of the AWARE study, launched by The Human Consciousness Project, twenty-five participating hospitals across Europe and North America have been examining reports of patients after their clinical death, several of whom are expected to have an out-of-body experience with physical perceptions of their surroundings. A major objective of the AWARE study is to test whether the perceptions reported by these patients can be verified. One method involves a visual target being placed near the ceiling where it can only be seen by someone reading it from above; patients who report OBEs are then asked to describe it. Read about the latest update of this study which was in January 2013. Consciousness and the possibility of its survival after death is perhaps the final frontier of science. Although a large body of knowledge exists about the brain, "The brain has not explained the mind fully" according to renowned brain surgeon Wilder Penfield. Materialistic science has yet to produce a conclusive model of consciousness. This is mainly due to its inability to quantify first-person, subjective experiences. Materialism views only objective, observable experiments verifiable by third parties to be valid. The current scientific method relies only upon repeatable experiments to verify a hypothesis; but its limit is reached when quantifying consciousness. Mainstream materialistic scientists claim consciousness is produced entirely by the brain. This is analogous to claiming television sounds and images are produced entirely by television sets, despite the fact television sounds and images are produced by TV stations transmitting nonlocal radio waves. This analogy describes consciousness based not upon the brain, but the brain based upon consciousness. There are a multitude of anomalous phenomena including NDEs which cannot be explained using the scientific method. These anomalous phenomena provides a theoretical basis for a nonlocal model of consciousness while materialistic scientists are unable to explain how immaterial, conscious, subjective experiences can arises from a material brain. Medical scientists have discovered areas within the brain collectively known as the "God Spot" which permits communication with cosmic information outside of material bodies. Theoretical physicists call this "quantum nonlocality." Psychologists call it the "collective unconscious." Hindus call it "Brahman." Buddhists call it "Nirvana." Jews call it "Shekinah." Christians call it the "Holy Spirit"; Christ and his disciples are called the "light of the world." New age adherents call it the "Higher Consciousness." According to Dr. Melvin Morse, the children he has resuscitated from death simply call it "God." Atoms and sub-atomic particles can exist in two or more locations simultaneously as multiple coexisting possibilities known as quantum superposition. The reason why we do not see quantum superpositions on a large scale in everyday life is known as the "measurement problem" which has led to various interpretations of quantum mechanics. Early experiments by quantum pioneer Niels Bohr and others seemed to show how quantum superpositions, when measured by a machine, stayed as multiple possibilities until a conscious human observed the results. Bohr concluded "conscious observation collapses the probability wave function" and unobserved superpositions continue to exist until being observed, at which time they too are collapsed to particular random states. According to Bohr, this "consciousness causes the collapse" of quantum possibilities places consciousness within the realm of science. But materialistic science views consciousness strictly on classical physics rejecting the possibility of quantum nonlocality in consciousness and equates the mind with the brain. Perhaps this is the reason Bohr made his famous statement, "Anyone who is not shocked by quantum theory has not understood it." However, recent evidence linking biological functions to quantum processes supports the possibility of consciousness having nonlocal quantum functions in the brain. This suggests the nature of conscious experience requires a world view in which consciousness has irreducible components of reality. This interpretation defines superpositions becoming separations in reality with each possibility evolving its own distinct universe - giving a multitude of universes. The difference between this theory and Bohr's interpretation is how the separations are randomly selected from among the superpositioned possibilities. The superposition of these locations can then viewed as separations in the very fabric of reality. This theory posits such conditions have evolved within the brain - inside brain neurons - where microtubules process quantum superpositions giving us our subjective reality. This quantum process within the brain may be the basis for consciousness transcending and surviving physical death as revealed in NDEs. In such altered states, the quantum process of superpositions may shift consciousness to different dimensions of higher frequencies. When NDEs occur, it is possible the quantum information of which consciousness is made of could shift to an existence outside the brain nonlocally. This supports the idea of the mind not being a material brain. An important principle of quantum physics is how human observation cannot be predicted absolutely. Instead, there's a range of possible observations to chose from in the form of probability waves each having a different probability and reality. With every thought, observation and action we make, we are constantly choosing just one of these possible probabilities of reality. One mainstream explanation for this is the "many-worlds interpretation" where each of these possible observations corresponds to a different universe within a "multiverse." This theory describes the existence of an infinite number of universes - including our own - which comprises all reality. This theory includes possible universe(s) where death doesn't exist, for example. The theory includes all possible universes existing at the same time despite what happens in any of them. Many-worlds theorizes our continuous choice of reality from possible probabilities does not collapse the universal wave function of all the other possible probabilities. Many-worlds implies all possible alternative histories and futures are real. Before the many-worlds interpretation, reality had always been viewed as a single unfolding history. Many-worlds, however, views reality as a many-branched tree, wherein every possible quantum outcome is realized. In many-worlds, every possible outcome of every event defines or exists in its own universe. Dr. Kenneth Ring described two kinds of precognitive visions in the NDE: (1) the personal "flash-forward" and the (2) "prophetic vision." A third category, defined by NDE researcher Craig Lundahl is the "otherworld personal future revelation (OPFR). The OPFR resembles the personal flash-forward in how it previews the experiencer's personal future, but differs from the personal flash-forward in how it is delivered to the experiencer by another personage in the otherworld rather than appearing in the visual imagery of a life review. The OPFR differs from the prophetic vision in having a personal rather than planetary focus. Lundahl cites four historic accounts to illustrate major features of the OPFR: (1) entrance into the otherworld, (2) encounter with (3) others who foretell the experiencer's future, and (4) later occurrence of the foretold events. The many-minds interpretation of quantum mechanics is an extension of the many-worlds interpretation by proposing distinctions between worlds should be made at the level of the mind of an individual observer. This is the principle supporting the theory of quantum immortality - an interpretation of quantum mechanics which theoretically makes it possible for a human observer to have a continuous infinity of minds in parallel universes. These observer states may then be assumed to correspond to definite states of awareness (i.e., many minds) as in the classical description of observation. In order to make this theory work, the mind must be a property which can separate from the body as suggested in NDEs and OBEs. In quantum theory, the "zero-point field" is a quantum vacuum state or "void" which generally contains nothing but electromagnetic waves and particles popping into and out of existence. A zero-point field of the universe is supportive of the holographic principle where consciousness and memories are not localized in the brain but are distributed throughout a holographic universe. Brains, acting as receivers, access certain frequencies of quantum information to process. This universal zero-point field describes the world and universe as a dynamic web where everything is connected, where consciousness influences matter and creates reality, and where all things are possible. According to Einstein, "Space and time are modes in which we think, not conditions in which we live." Dr. Ervin Laszlo, twice nominated for the Nobel Prize, is an integral theorist and champion of this zero-point field as instrumental when understanding consciousness and the universe. Laszlo is generally recognized as the founder of systems philosophy who emphasizes the importance of establishing a holistic perspective on the world and man through quantum consciousness. Lazlo's groundbreaking book, "Science and the Akashic Field: An Integral Theory of Everything" makes a compelling case for the zero-point field to be the substance of the entire universe. It can theoretically be viewed as the source of all consciousness and matter in the universe. Using the Hindu concept of a "cosmic memory" called the "akashic records," Laszlo theorizes the zero-point field to be the fundamental energy and information-carrying field of the universe, past and present, including all possible parallel universes. Laszlo describes how such an informational field explains why the universe appears to be fine-tuned as to form conscious life forms. Laszlo's zero-point akashic field theory solves several problems in quantum physics from nonlocality to quantum entanglement. Laszlo's theory agrees with revelations from the Christian mystic Edgar Cayce. When Cayce was asked where he received his psychic information, he answered it was from "the intelligent infinity" as it is "brought into intelligent energy" as a gateway to view the present. Cayce acknowledged this "gateway" to be equivalent to the Hindu concept of the "akashic records" and the Christian concept of the "Book of Life." Cayce revealed these otherworldly records are stored in a heavenly "Hall of Records" which corresponds to the so-called "Temple of Knowledge" or the "Temple of Wisdom" appearing in many NDE testimonials. Dr. Laszlo's theory is supported by important scientific research. For example, biologist Paul Pietsch experimented with salamanders to locate where memories are stored in the brain. He removed their brains, grinded them up, even shuffling their brains around, and then placed them back in their heads. The astonishing result was their memories where unaffected although their brains were demolished. Pietsch's conclusion was memory was not a local phenomenon, but is linked to something outside their bodies. His findings were published in his book, Shufflebrain: The Quest for the Hologramic Mind." Neuroanatomist Harold Burr conducted similar experiments with salamanders and discovered a field of light surrounding their unfertilized eggs in the shape of an adult salamander. Burr also noticed fields of light surrounding plant seeds taking the shape of mature plants. Burr's research supports Pietsch's findings of physical bodies being connected to a surrounding energy field. Burr's findings where published in his book, "The Fields of Life: Our Links with the Universe." This energy field may account for the salamander parts growing back when they are removed. This energy field may also explain why human amputees sometimes feel "phantom pain" from their amputated body part as described by NDE expert Robert Mays. This energy field also supports the phenomenon of people having undergone organ transplants taking on certain "memories" from the organ donor. The discovery of an "electromagnetic zero-point field" lends credibility to the possibility of having vast memory storage capabilities outside of the physical body. Phenomena such as these can be best understood if the zero point field can be "tapped" as a storage location for information and energy which can be accessed at any time. "Suddenly I rolled into a ball and smashed into another reality. The forces that brought me through the barrier were terrific. I was on the other side. I realized that the boundary between life and death is a strange creation of our own mind, very real (from the side of the living), and yet insignificant." Swenson felt he was floating in a universe with no boundaries. "I had total comprehension of everything. I stood at the annihilation point, a bright orange light. As I felt my mind transported back to my body, I thought, please let me remember this new theory of relativity." In the 1970s, Stephen Hawking put forward a theory of black holes which appeared to violate a major principle of physics - the law of the conservation of information - because it implied quantum information can permanently disappear within a black hole with the exception of "Hawking radiation." Hawking's inconsistent theory led to what was called the "Black Hole Information Paradox." Physicist Leonard Susskind (pictured on the left) later solved this paradox with his development of M-theory using the holographic principle to show how information entering the edge of a black hole is not lost, but can entirely be contained on the surface of the horizon in a holographic manner. Susskind's theory solved the paradox because the nature of a hologram's two-dimensional information structure can be "painted" on the edge of the black hole thereby giving a three-dimensional black hole where quantum information is not lost. Susskind's solution to the information paradox led to wide-spread acceptance of the holographic principle. David Bohm was convinced all matter in the universe, including our physical body, is composed of light in a condensed "frozen" state. NDE experiencers have often described their spirit bodies as "bodies of light." During an NDE the experiencer transitions from the material world which operates at speeds less than the speed of light to a dimension which operates at faster-than-light speed. The NDE experiencer may first observe the earth or the universe from space before this transition. In transitioning from the material to the spiritual dimension, the experiencer may first enter a "NDE tunnel" much in the same way a "body of light" might experience what astrophysicists call a "black hole." As previously mentioned, Leonard Susskind's theory of black holes allows for light particles to travel through a black hole without being destroyed. At faster-than-light speed, a "body of light" could enter into a time and spaceless dimension where this body of light can move forward and backward through space-time. This NDE tunnel, like a black hole, appears to be a "portal" to another dimension of reality. Dr. Robert Lanza is considered one of the leading scientists in the world. He is a medical researcher at the forefront of developments in cloning, organ transplantation, and stem-cell transplantation. His mentors described him as a "genius" and the "Bill Gates of Science." As a young preteen, Lanza caught the attention of Harvard Medical School researchers when he successfully altered the genetics of chickens as a class project. Eventually, he was discovered and mentored by such scientific giants as psychologist B.F. Skinner, immunologist Jonas Salk, and heart transplant pioneer Christiaan Barnard. A Fulbright Scholar, Lanza was part of the team cloning the world's first human embryo for the purpose of generating stem cells. Dr. Lanza's work has been crucial to our understanding stem cell biology. A year after receiving his medical degree Lanza published a book on heart transplantation. In 2009, he published a book entitled, "Biocentrism: How Life and Consciousness are the Keys to Understanding the True Nature of the Universe." Reviews of his work include Nobel laureate E. Donnall Thomas who stated "Any short statement does not do justice to such a scholarly work. The work is a scholarly consideration of science and philosophy bringing biology into the central role in unifying the whole." Biocentrism's main tenet is biology being the most important science in understanding life and the universe. Other sciences require a more deeper understanding of biology - specifically life and consciousness - to make their theories of everything complete. The areas of biological research playing a central role in understanding life and consciousness must include neuroscience, brain anatomy, NDE and OBE consciousness studies, and even artificial intelligence - all of which will eventually force materialistic scientists to seriously confront the issues biocentricism raises. Robert Lanza also uses his theory of Biocentrism to explain the possibility of consciousness surviving death by such articles as: (a) "What Is It Like After You Die?," (b) "Is Death the End? Experiments Suggest You Create Time," (c) "Does Death Exist? : Life Is Forever, Says Theory," and (d) "What Happens When You Die? Evidence Suggests Time Simply Reboots." Biocentrism also explains a major scientific paradox of how the laws of physics fits so precisely allowing for conscious life to exist. There are over 200 precise parameters in physics describing the universe which suggests the universe is fine-tuned for an environment which life and consciousness requires. There are four explanations for this paradox: (1) it is an astonishingly improbable coincidence, (2) God created it - an explanation which science cannot quantify even if it is true, (3) the "Anthropic Principle" which assumes a fine-tuned universe exists because this is just the way it is, and (4) Biocentrism's theory of a biologically aware universe created by biologically aware life. Physician Deepak Chopra agrees with biocentrism being "consistent with the most ancient wisdom traditions of the world which says that consciousness conceives, governs, and becomes a physical world. It is the ground of our Being in which both subjective and objective reality come into existence." Physicalism is a theory which posits only physical things exist. Materialism is a related theory which posits only matter and energy exist; and everything is composed of these materials; and all phenomena are the result of physical interactions. In other words, reality is limited to states of energy and matter. Applied to consciousness, it holds that all aspects of subjective experience is explainable purely by objective states within a physical brain. But the problem with materialism, as applied to the consciousness, is it does not distinguish between mind and brain. This explanation problem of materialism suggests there exists a metaphysical, non-physical component to subjective experiences philosophically known as "qualia". The person who has arguably done more to support the subjective nature of consciousness is Dr. David Chalmers, the distinguished Professor of Philosophy and Director of the Centre for Consciousness in Australia, who specializes in the area of philosophy of mind and philosophy of language. Chalmers has authored an amazing number of resources on topics related to consciousness and philosophy. He is the author of MindPapers (a comprehensive online bibliography of philosophy), and the author of a directory of online philosophy papers, and co-directed the development of a wealth of online philosophy articles called PhilPapers. Chalmers is also the blogmaster of Fragments of Consciousness and the author of the book, "The Conscious Mind: In Search of a Fundamental Theory." Chalmers defined this explanatory problem of materialism as the "hard problem of consciousness." Chalmers illustrated this problem using the thought experiment of a "brain in a vat" (see the graphic on the left). If a person's brain is suspended in a vat of life-sustaining liquid and its neurons connected to a supercomputer providing it with electrical impulses identical to those the brain normally receives, the computer could then simulate reality and the person with the "disembodied" brain could continue to have perfectly normal conscious experiences without being related to objects or events in the real world. In this case, because the experience of being in a vat and the experience of being in a skull would be identical, it would impossible to tell from the brain's perspective of whether it is in a skull or a vat. Yet when the brain is in a skull and running on a beach, most of the brain's beliefs may be true. But when the brain is in a vat, the brain's beliefs are completely false. Therefore, because the brain cannot make such a distinction, there cannot be solid ground for the brain to believe anything it believes. This Brain-in-a-Vat Argument is similar to the "Dream Argument" which suggests the brain's ability to create simulated realities during REM sleep means there is a statistical likelihood of our own reality being simulated. Lucid dreams also supports this. There is also a long philosophical and scientific history to the underlying thesis of reality being an illusion which is centered on the assumption we do not experience the environment itself but rather a projection of it created by our own minds. A serious academic debate within the field of transhumanism centers around a related argument called the "Simulation Argument" which proposes reality to be a simulation and our current paradigm of reality to be an illusion. Physicists have even developed a scientific experiment to determine if our universe is a computer simulation. Also, as previously mentioned, several interpretations of quantum mechanics, such as the Holographic Principle, suggests our perception of reality to be holographically an illusion. Near-death studies supports these arguments and goes even further. The life review process is often described by NDE experiencers in terms of viewing "television-like" screen(s) where they review every second of their life instantaneously - including the perceptions of everyone on earth they ever came into contact with throughout their life. Another aspect of NDEs supporting simulism is the out-of-body component to the NDE. Experiencers have described out-of-body conditions where they view their physical body from above in a different "body" - a phenomenon known as autoscopy. Sometimes these perceptions are verified later by third-parties - a phenomenon known as veridical perception. Veridical dreams have also been reported. See . Veridical NDEs are reports of veridical perception during the out-of-body component of the NDE which are later confirmed to be accurate. See . Often, these perceptions are very detailed and specific. Some reports of veridical out-of-body perception involve detailed observation of events too distant for the physical body to perceive. See . Also, while some NDE experiencers are having their out-of-body component, they may become aware of an even "higher" version of themselves (see Dr. Dianne Morriseey's NDE for a good example). This also explains why some NDE experiencers have reported seeing "higher versions" of living people on earth. See Carl Jung's NDE for the ultimate example where he sees the "avatar" of his friend during his NDE. While such evidence may not persuade the skeptics, the millions of individuals who have experienced an NDE are absolutely convinced of consciousness surviving bodily death. "... the reductive materialist (physicalist) model, on which conventional science is based, is fundamentally flawed. At its core, it intentionally ignores what I believe is the fundament of all existence - the nature of consciousness ... From their [Albert Einstein, Neils Bohr and Erwin Schrodinger] experiments one could infer that consciousness has a definite role in creating reality. And those experimental results have only become more bizarre in recent years. (Witness the "quantum eraser" experiment performed in 2000.) I believe that the core of that mystery is that consciousness itself is deeply rooted in quantum processes. "Even the physicists and scientists who proselytize the materialistic model have been forced to the edge of the precipice. They must now admit to knowing just a little bit about 4% of the material universe they know exists, but must confess to being totally "in the dark" about the other 96 percent. And that doesn't even begin to address the even grander component that is home to the "consciousness" that I believe to be the basis of it all. Such quantum eraser experiments mentioned by Dr. Alexander reveal an astonishing fact about how consciousness is the supreme factor in quantum physics. These experiments reveal how an experimenter is able to successfully chose and predict the random outcome of an event even after the outcome has already taken place. They prove how the outcome of such experiments - whether a photon of light is a wave or a particle - can be predicted after the fact by the experimenter making a random mental choice of the experiment's outcome. In other words, the experimenter's after the fact choice of the outcome actually determines the experiment's outcome. These astonishing findings dramatically suggest the possibility of our choices made today may determine the outcome of the past. For these reasons and more, consciousness cannot be explained entirely as objective events experienced the brain. Consciousness must also be explained in terms of the subjective events experienced in the brain. This leads to such questions as, "Why is there a personal, subjective component to experience?" and "Why aren't we all philosophical zombies?" This "brain in a vat" argument shows how subjective experience cannot be reduced to the functional properties of physical processes in the brain. A complete definition of consciousness must include a component describing subjective, conscious experiences which have not been explained in materialistic terms. This brain in a vat argument is a contemporary version of the argument given in Plato's Allegory of the Cave. Neppe described the possibility where, under such circumstances, an individual exposed to a purely mental universe, independent of matter, containing all mental events, may experience overlap or be entangled with the physical universe. This is supported by similarities existing between elements of NDEs and the quantum field concept of subjectivity. They suggest all events are related and influence each other instantaneously and in reciprocity, and only subjectivity remains.. These arguments of subjectivity support the holistic paradigm of the illusionary "separation" between the subjective observer's experience and the objective object being observed. Because the old materialistic paradigm is unable to explain conscious experiences, it leads many scientists to simply ignore it altogether as being a problem. This ignorance is demonstrated by pseudoskeptics (such as "old paradigm cops") of anomalous conscious experiences and by materialistic critics of subjective experiences including NDEs and OBEs. Materialism cannot explain how consciousness arises from "goo" or how atoms in the brain comprises consciousness. The new holistic paradigm views reality to be in the eye and mind of the observer/beholder. Philosopher Thomas Nagel also makes a compelling case of materialism never, in principle, developing an objective explanation of consciousness. a. van Lommel, P. (2013). Non-Local Consciousness: A Concept Based on Scientific Research on NDEs During Cardiac Arrest. Journal of Consciousness Studies. b. Venselaar, M. (2012). The Physics of Near-Death Experiences: A Five-Phase Theory. Noetic Now Journal. K kumar Mukherjee (2012). Three Cases of NDE. Is it Physiology, Physics or Philosophy? Annals of Neurosciences. d. S Hameroff, D Chopra. (2012). The “Quantum Soul”: A Scientific Hypothesis. Exploring Frontiers of the Mind-Brain Relationship. e. Ratner, J (2012). Radiant Minds: Scientists Explore the Dimensions of Consciousness. NeuroQuantology. f. E Facco, C Agrillo. Near-Death Experiences Between Science and Prejudice. Frontiers in Human Neuroscience. g. C Fracasso, H Friedman. (2012). Electromagnetic Aftereffects of NDEs: A Preliminary Report on a Series of Studies Currently Under Way. Journal of Transpersonal Research. h. JP Jourdan. (2011). Near-Death Experiences and the 5th Dimensional Spatio-Temporal Perspective. Journal of Cosmology. i. B Greyson. (2011). Cosmological Implications of Near-Death Experiences. Journal of Cosmology. j. RG Mays, SB Mays. (2011). A Theory of Mind and Brain that Solves the “Hard Problem” of Consciousness. The Center for Consciousness Studies. k. J Pilotti. (2011). Consciousness and Physics: Towards a Scientific Proof that Consciousness is in Space-Time Beyond The Brain. Journal of Transpersonal Research. l. GD Belaustegui. (2010). Phenomenology of the Transcendence of Space-time Coordinates: Evidence from Death Announcements. Jung Journal: Culture & Psyche. m. V Laws, E Perry. (2010). Near Death Experiences: A New Algorithmic Approach to Verifying Consciousness Outside the Brain. NeuroQuantology. n. K Ray, MK Roy. (2010). A Theoretical Basis for Surges of Electroencephalogram Activity and Vivid Mental Sensation During Near-Death Experience. International Journal of Engineering Science and Technology. o. D Pratt. (2007). Consciousness, Causality, and Quantum Physics. NeuroQuantology. p. P van Lommel. (2006). NDE, Consciousness, and the Brain: A New Concept About the Continuity of Our Consciousness Based on Recent Scientific Research on NDE in Survivors of Cardiac Arrest. World Futures. q. RA Brian. (2003). What can Elementary Particles Tell Us About the World in Which We Live? NeuroQuantology..
r. RJ Brumblay. (2003). Hyperdimensional Perspectives in Out-of-Body and Near-Death Experiences. Journal of Near-Death Studies. s. FG Greene. (2003). At the Edge of Eternity's Shadows: Scaling the Fractal Continuum from Lower into Higher Space. Journal of Near-Death Studies. t. TE Beck, JE Colli. (2003). A Quantum Biomechanical Basis for Near-Death Life Reviews. Journal of Near-Death Studies. u. CR Lundahl, AS Gibson. (2000). Near-Death Studies and Modern Physics. Journal of Near-Death Studies. The Mereon Matrix is a 900+ page academic textbook about a new mathematical discovery found in the NDE of Lynnclaire Dennis. This unique geometrical "Pattern" she saw in the Light led her begin an investigation to understand what she knew was an important scientific discovery given to her to help humanity solve some of its most critical problems. The importance of this discovery - a "Pattern of patterns" - is underscored by the fact that The Mereon Matrix was published by Elsevier, the world's leading provider of science and health information. Each chapter of this book is self-contained and explained relative to the Mereon Matrix's functional process and provides references to scientific findings congruent with or expanded by the Mereon Matrix. This book offers a new way of systems modeling which has been and can be applied across a multitude of sciences. The author outlines the basis for the new physics - one that recognizes consciousness as a fundamental part of reality and opens the door to paranormal phenomena and God as "Quantum Mind." Could it be that light and God are one in the same? Physician Lee Baumann makes a case for exactly that. From many sources, Dr. Baumann has synthesized a compelling picture of what may be the true nature of our universe at all levels - physical, mental, and spiritual. Beginning with physicist David Bohm and neurophysiologist Karl Pribram, both of whom independently arrived at holographic theories explaining the nature of the universe, Talbot explains in clear terms this theory and applies it to both science and and the paranormal. Dr. Wolf proves the spiritual and scientific basis for the existence of the soul by using insights into the world of quantum physics. The scientific case for a self-aware universe. Consciousness, not matter, is the ground of all existence. Consciousness created the physical world. There is no objective reality independent of consciousness. The so-called mind-body schism is illusionary. Classical physics rules out "spooky action at a distance" (i.e., a billiard ball cannot move unless something contacts it.). But the new physics permits "non-local" action (i.e., do certain things to a photon and another photon can be affected at faster than light speed). Hence, all of physical reality is a single quantum system and reality. Observations of "non-ordinary" states of consciousness support the theory that the mind is essentially "holotropic" (i.e., like a hologram wherein the whole can be reconstructed from a tiny part). Thus, our infinite transpersonal consciousness can transcend not only the time-space continuum but even visit other dimensions and parallel universes. Russell, well known for his work on the physiology of meditation, describes his personal struggle to bring science and spirit together. By describing the more mysterious discoveries of contemporary physics as a source of spiritual inspiration, the scientific study of consciousness can yield an insight into consciousness that religions call "God". What is consciousness? How do physical processes in the brain give rise to the self-aware mind and to feelings as profoundly varied as love or hate, aesthetic pleasure or spiritual yearning? Now, in The Conscious Mind, philosopher David J. Chalmers offers a cogent analysis of this heated debate as he unveils a major new theory of consciousness, one that rejects the prevailing reductionist trend of science, while offering provocative insights into the relationship between mind and brain. This book investigates the astonishing claim that blind persons, including those blind from birth, can actually "see" during near-death or out-of-body episodes. The authors present their findings in scrupulous detail, investigating case histories of blind persons who have actually reported visual experiences under these conditions. Current mainstream opinion in psychology, neuroscience, and philosophy of mind holds that all aspects of human mind and consciousness are generated by physical processes occurring in brains. Views of this sort have dominated recent scholarly publication. The present volume, however, demonstrates empirically that this reductive materialism is not only incomplete but false. The authors systematically marshal evidence for a variety of psychological phenomena that are extremely difficult, and in some cases clearly impossible, to account for in conventional physicalist terms. In Science and the Akashic Field, philosopher and scientist Ervin Laszlo conveys the essential element of this information field in language that is accessible and clear. From the world of science he confirms our deepest intuitions of the oneness of creation in the Integral Theory of Everything. We discover that, as philosopher William James stated, "We are like islands in the sea, separate on the surface but connected in the deep." While providing many accounts of NDEs from men, women, and children of all ages and backgrounds, Lessons from the Light is much more than just an inspiring collection of NDEs. In Lessons near-death expert Kenneth Ring extracts the pure gold of the NDE and with a beautiful balance of sound research and human insight reveals the practical wisdom held within these experiences. Biocentrism takes the reader on a seemingly improbable but ultimately inescapable journey through a foreign universe - our own - from the viewpoints of an acclaimed biologist and a leading astronomer. Switching perspective from physics to biology unlocks the cages in which Western science has unwittingly managed to confine itself. Biocentrism will shatter the reader’s ideas of life - time and space, and even death. At the same time it will release us from the dull worldview of life being merely the activity of an admixture of carbon and a few other elements; it suggests the exhilarating possibility that life is fundamentally immortal. In recent years, a handful of scientists has been racing to explain a disturbing aspect of our universe: only 4 percent of it consists of the matter that makes up you, me, and every star and planet. The rest is completely unknown. Richard Panek tells the dramatic story of how scientists reached this cosmos-shattering conclusion. In vivid detail, he narrates the quest to find the “dark” matter and an even more bizarre substance called dark energy that make up 96 percent of the universe. Written by a physicist in neuroscience research who has experienced multiple NDEs, this book describes how and why reality, this universe, is interdependent with consciousness in order to exist, where the idea came from, and why. The author is an Oxford scholar who uses evidence from scientific studies, quantum mechanics, and consciousness research, to reveal how consciousness does not depend on the brain. Examines ancient and modern NDEs providing evidence of the survival of consciousness after death while debunking the materialistic arguments raised by skeptics. Kellehear presents a revolutionary new approach to the field of near-death studies, one that examines these episodes as they relate to the specific cultures from which they arise, helping us to understand what these visions are as a cultural and psychological response and why they occur. Kellehear compares NDEs from all over the world - India, China, Guam, America, Australia, and New Zealand - revealing not only the similarities among them, but also the pertinent differences that can tell us much about the way people from different cultures view their world. Begun in 1994, The Atlanta Study is the first comprehensive investigation of its kind into NDEs. The study presents life-and-death dramas played out in operating rooms and hospital beds - and simultaneous events unseen by medical personnel but reported with astonishing clarity and conviction by nearly 50 individuals who returned from death's door. Now the founder of The Atlanta Study, Dr. Michael Sabom reveals their impact on the people who have experienced them. Dr. Moody shares eyewitness accounts of those who have shared the experiences of the dying: the "empathic death experiences" occurring when those gathered at the bedsides of the dying have their own visions of the afterlife. NDE expert Dr. Jeffrey Long presents the strongest arguments yet for the underlying truth of those who have died and returned to share their tales. The author of the famous Dutch NDE study offers even more ground-breaking research into whether or not our consciousness survives the death of our body. The author of the AWARE Study presents cutting-edge research from the front lines of critical care and resuscitation medicine on what happens to human consciousness during and after death. The author is an Orthopedic surgeon who drowned and had an NDE which gives details of heaven and her communication with angels. The author sheds light on the links between science and mysticism, revealing the area of the brain linking us to the universe, and is filled with moving case histories, applying the rigor of science to the study of the spiritual, thereby proving the existence of life after death. This essential handbook by leading NDE experts provides everyone (especially health professionals) with the knowledge needed to understand NDEs and those who have them by examining children's NDEs, NDEs from a religious perspective, the role of light in NDEs, the assessment and management of NDEs, and the future of NDE research. The author is the UK's leading neuropsychiatrist on the subject of NDEs whose outstanding book provides detailed descriptions and statistics from a study involving the NDEs of hundreds of people.